This castle is unique because it was a private gothic home for years then a hospital. Many state it has the strongest paranormal activity in the UK. Graig Y Nos has a variety of hauntings. It is located within the very beautiful Brecon Beacons National Park in the Upper Swansea Valley in South Wales. 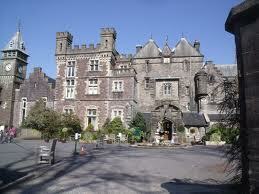 A British army captain, Rice Davies Powell who was a surgeon built the castle in 1841. The castle drained his finances and it is said his family was cursed because of their bloodline. His wife and two younger children died of disease and his eldest son was killed in a hunting accident. After this the captain went blind and then insane. The next family to own the castle were the Morgans. They stayed only a brief two years. 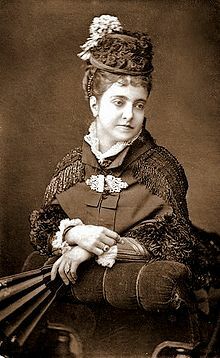 Adelina Patti a prima donna opera singer and superstar of her day fell in love with the castle in 1876 and bought it. She renamed the castle Graig Y Nos meaning “Rock of the Night”. Patti lived in the castle for over fifty years. She had a 150-seat theatre auditorium built where she performed for friends and the world’s elite. Her black clad ghost is seen in various places around the castle but most often in this theatre. It is stated that if someone sings her favorite song, “Home Sweet Home” she will appear. Her ghost is also heard singing in a large room upstairs that once was her boudoir. The ghosts of her second husband and the man she admired most the composer Rossini also are seen. When Patti died in 1919 her body was kept in the castle cellar until it could be embalmed. In her will she requested to be buried with Rossini, she was but then for some unknown reason his body was moved. It is stated that this is why they both haunt the castle. After Adelina Patti’s death the castle was used as a tuberculosis sanatorium starting in 1922. This hospital was named after Patti. For over thirty-seven years patients were treated for this disease, unfortunately many didn’t survive. It is believed their ghosts still roam the castle. Witnesses over the years state they have seen patients that seem to be confused and lost walking along the first floor corridors. Nurses who worked at the sanatorium stated that they were always nervous on the back stairs. They heard skirts rustling as if an unseen person walked in front of them. Others saw a ghostly figure pass them on this same staircase. Many other visitors have reported a heavy feeling that seemed to constrict their breathing while they were in the castle. Doors are seen opening of their own accord even when bolted shut and footsteps and bangs are heard. One of the most active spots in the castle is where the Children’s Ward was located. Many apparitions have been seen here. Childlike giggles and footsteps are heard as well as balls bouncing. A film crew who was conducting an interview in the castle’s kitchen experienced Adelina Patti’s temper. It was stated that although a very accomplished soprano Pattie was never able to master the role of Carmen. Suddenly a saucepan that was placed on the back of a cook stove flew off and fell to the floor. 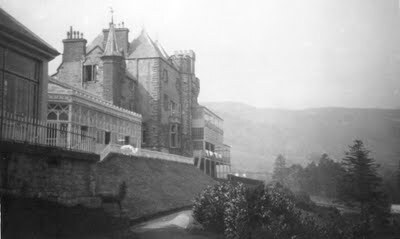 By the late 1950s the castle was being used as a hospital for the elderly. In 1986 the last patients were transferred to a newer facility. Since then the castle has been restored. Today it is used as a hotel. There is so much activity that the owners encourage investigations. They often host paranormal conferences. One of the best-known ghosts in Germany is connected to the Hohenzollern Family who ruled Prussia for four hundred years. The Hohenzollerns were first electors of the Holy Roman Empire and then later they were emperors. The ghost that haunted them was known as the “”White Lady”. Members of the Hohenzollern family saw this ghost for centuries. The White Lady was considered a harbinger for when she appeared it was always a warning to the descendants of King Frederick that someone in the family was about to die or some disaster was about to occur. In the Middle Ages widows of deceased sovereigns and princes always wore white mourning. The Hohenzollern ghost was always seen wearing white. This White Lady was described as very beautiful but melancholy in appearance. She was tall, very thin, and walked with a poise befitting her station while alive. All who saw her stated she always carried a bunch of large keys attached to a chatelaine at her waist. She was first seen in 1619 when three young pages spotted her in one of the castle’s halls. One of these pages approached her to ask what she was doing there. She turned and whacked him over the head with her keys. He fell to the ground dead. The other two pages fled. 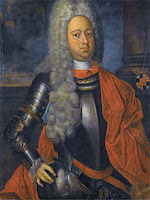 The next day Elector John Sigismund died. The one time the White Lady spoke it is said she quoted Latin, “Veni, judica vivos et mortuos” meaning-- come, judge the living and the dead. After this appearance in 1628 a young prince of the house died. In 1678 she appeared again. Soon after this Erdmann Phillip fell from his horse and died. It is said the White Lady never appeared during Frederick the Great’s reign because he did not believe in ghosts. But after his death he appeared to warn a family member about this harbinger. 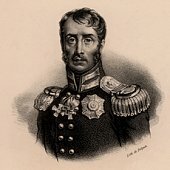 His nephew Frederick William the Second in 1792 was camped outside Paris with his troops. The night before they were set to attack his uncle’s ghost appeared before him in a wine cellar and cautioned him not to attack. “He warned him to call off his troops, or you will see the White Lady.” The nephew heeded his uncles’ advice and left France. During the Age of Enlightenment this ghost made several more appearances. She again appeared just before the deaths of Frederick William the Third in 1840 and Frederick William the Fourth in 1861. One of the last reported sightings of the White Lady was in 1914 just before World War l. She appeared just before the Archduke Franz Ferdinand was assassinated. I wrote about Ferdinand’s cursed and haunted car in another post here. After the German’s defeat in World War l, Kaiser Wilhelm the Second was the last ruling Hohenzollern-- he abdicated the throne. 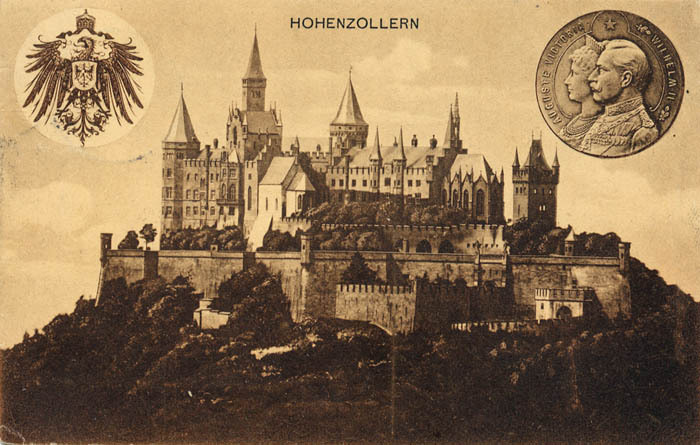 It is stated that once there was no longer a Hohenzollern ruler the White Lady was finally able to find peace. But many state that the White Lady was seen one last time during World War ll in 1945 just before Berlin burned. There are several legends as to who the White Lady was when she was alive. Each is more tragic than the next. Here are just two. One common tale is that she was a young widowed countess who fell madly in love with a Hohenzollern. She came to believe that her children from her first marriage were stopping him from marrying her so she killed them. When he found out about what she had done he shunned her and married another at which point she committed suicide. It is stated that then she haunted and cursed the family for centuries. Yet another story is just as tragic. A young daughter was forced by her father to marry a man she didn't love for political and financial reasons. Her father neglected to pay her dowry. The young bride found to her chagrin that her new husband either ignored her or beat her. She begged her father to rescue her but he ignored her pleas. He instead blamed her problems on “her not loving her husband enough”. Her brothers finally rescued her and took her home. Her husband was related to the Hohenzollern family. So when she died it is stated she haunted the Hohenzollern descendants in order to reek revenge. The Hohenzollern dynasty is not the only family that was plagued by a harbinger. The royal Hapsburg’s had a raven and a White Lady that were both considered death omens. There are free samples of this channel on YouTube. These productions are well-produced episodes that focus on both well-known and obscure hauntings around America. To view all of them you have to subscribe and sign-in but I have found they are worth the extra effort. 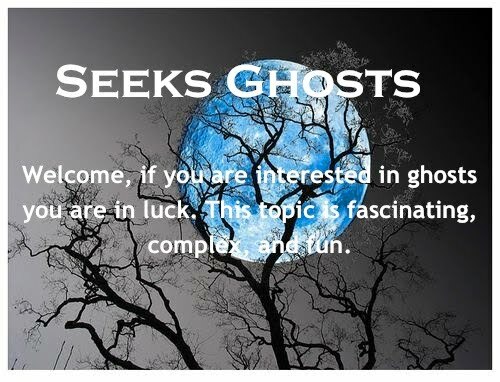 The stories they tell most often have witnesses with first hand accounts about the ghost or ghosts they have encountered. They always include recent sightings etc. They also tap into a variety of sources: psychics, parapsychologists, mediums, authors and spiritualists etc. to narrate these stories. These narrators usually have some direct link to the stories they share. The following free fifty-seven minute video is one they produced. It gives the viewer a good idea of the production value of Paranormal TV. The only drawback is that since it is free there are ads within it but you can “skip them”. What I find useful about this series is they also periodically debunk some stories about hauntings. The following video is worth a look-see. One story it shares about the “The Lady Who Walks the Stairs” in the hacienda on a ranch called, “Los Luceros” in Alcalde, New Mexico just 40 miles north of Santa Fe is one I have investigated. I will share my story about this house in future. Enjoy the video entitled "Hauntings Across America". 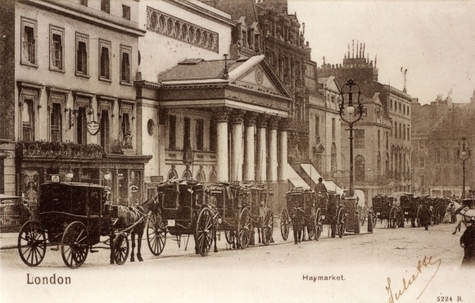 The Haymarket is the second oldest theatre in London. 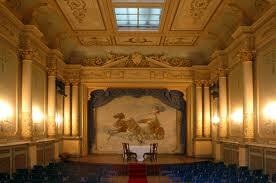 * The original little theatre in the Hay was built in 1720. This playhouse lasted for a century. It was abandoned in 1821 and a new larger theatre was built next door. John Nash designed this magnificent theatre called, “Theatre Royal Haymarket”. The Haymarket is still in use. It has hosted many successful productions over the years. John Baldwin Buckstone is said to still haunt the building today. From 1853-79 John Buckstone was associated with the Haymarket first as a comic actor, then as playwright and finally as the theatre’s manager. He wrote 150 plays, he starred in many of them. When he died at the age of 77 he was fondly remembered by all who worked with him. Some state his strong connection to the Haymarket keeps his ghost in residence. Many actors and staff at the theatre have shared their stories of encounters with Buckstone’s ghost in the hundred years since his death. It is stated that he is most often seen when the Haymarket is hosting comedies. Over the years there have been reports of cold spots, doors opening, lights turning on and off and items being moved, without normal explanations. Buckstone’s apparition has also been seen on a regular basis. One stage manager in the 1940s seeing what she thought was a stagehand on the stage during a performance went into a panic. Thinking he must be drunk she went to ring down the curtain only to see this figure disappear. Later she realized that the clothing she saw the figure wearing was not of a stagehand. Her description of the man led others to believe it must have been Buckstone on the stage that night. Buckstone’s ghost has been seen in several areas in the theatre. One actor saw him on a staircase landing as he left his dressing room. He thought he must be another actor because he was in costume. He greeted him as he passed but when he looked back up the landing this figure had disappeared. Another witness saw him in one of the theatre boxes. He stated he felt a chill breeze before he saw Buckstone’s apparition. Both these witnesses stated when they talked to Buckstone they did not receive a reply. Two famous actors appearing at the Haymarket had their own encounters with Buckstone’s ghost. 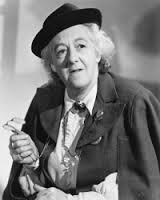 On a very foggy night in 1963, Margaret Rutherford who was appearing in a comedy play at the theatre decided it was too dangerous to make her way home. She stayed in her dressing room that night. The next morning she reported that she had seen Buckstone’s ghost appear in front of her. She described seeing a hairy leg and face appear out of a cupboard. 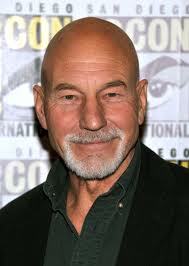 In 2009, Patrick Stewart while performing in a play at the Haymarket also spotted Buckstone’s ghost. During Act One while on stage he went down on his lines. During an interval his co-star, Sir Ian Mckellen asked him what had thrown him. He explained that he had seen a ghost standing in the wings wearing what looked like a beige coat and twill pants. Hearing of this encounter the director of the theatre stated that it had been some time since Buckstone’s ghost had appeared. An actress had last seen his apparition ten years before. The two actors were surprised because the play they were starring in was not a comedy. * The oldest theatre in London is Drury Lane it is also haunted. I share this story here.